Floratex has been actively involved in the trade of flowers, decoration green and green products for more than 50 years and has a lot of experience in this business. For more than 20 years, the foliage farm Multi-Greens GmbH has been working in the trade of decoration green and green products. 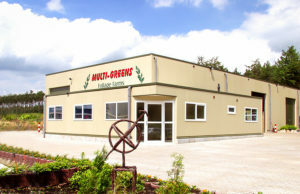 The foliage farm Multi-Greens GmbH is the German subsidiary of Floratex Nederland BV. Since 1997 Floratex divested all flower activities, and one fully focus on the production and the sale of decoration green, green products and Christmas trees. The company Multi-Greens was founded in 1999 and took over the German production areas, previously owned by Floratex. Through proper coordination with public transport is Floratex / Multi-Greens able to daily throughout the Netherlands to deliver the required products on time. Next to our main types of foliage: Oak leaves, Pinus strobus, Heidelbeer and Abies Nobilis we also supply many other species such as Photinia, Leucothoe, Abies Nordmanniana, Sour, Forythia, Polygonium, Birch, Mosses, etc. Our products are offered through both the auction and directly supplied by order. Continuous delivery and / or large orders are our specialization also limit deliveries made by appointment.